Das Stue in Berlin, Germany. Ranked #91 in our countdown of the 100 Best Hotels and Resorts in the World. 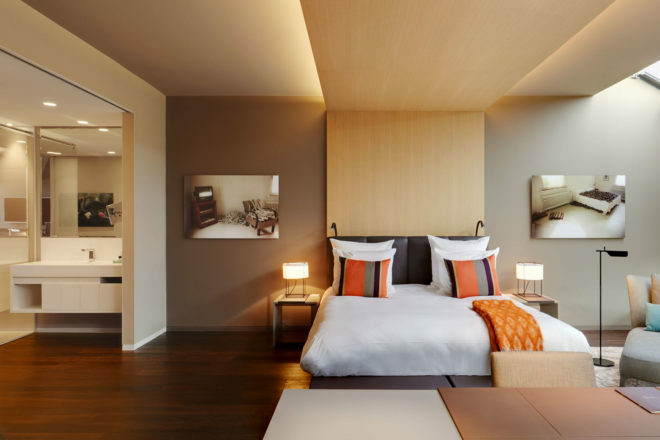 A style-maven haven, Berlin’s newest design hotel is a paradigm of contemporary Euro-chic. Within the former 1930s Royal Danish Embassy and an angular, statement extension, Spanish designer Patricia Urquiola has created an intimate, sophisticated and highly original ambience. Neutral hues are lifted by acid-citrus accents. Kooky sculptures of gorillas and giraffes are an amusing play on the wildlife lurking outside – the hotel overlooks Berlin Zoo. Guest rooms are spacious sanctuaries of fine design. Michelin-awarded chef Paco Pérez directs the Catalonian-inspired menus, which range from fusion tapas to artistic dégustation menus of up to 25 courses. There’s a buzzy bar too that stocks whiskies and cognacs not otherwise found in Berlin. Did you know Das Stue doubles as an art gallery. The photography collection reveal moments of the glamorous world of fashion, with a focus on the ’50s and ’60s.